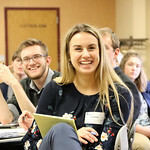 Bloomsburg University’s College of Education in collaboration with Professional U hosted its annual Collaborating to Assist Teacher Candidate Hiring (CATCH) Conference this spring for nearly 130 current student teachers. More than 100 education professionals representing 45 school districts — some as far away as Alaska — were on hand recruiting the soon-to-be graduates. In addition, the conference offered a morning panel with administrators followed by three tracks of alumni teacher panels, focusing on early childhood/elementary, middle level and secondary level. Students then prepared for the Education Expo through round table discussions: How to “sell” your experience to recruiters. Education majors represented the following certification areas: secondary education, early childhood/elementary education, middle school level, special education, deaf education, business education, and music education.